When Anoop Prakash (MD, Harley-Davidson India) launched the Street 750 in the Indian two-wheeler market, he had described the bike as a “blank canvas”. What he meant was that he was giving the customer a Harley-Davidson at the least possible cost and expected him to customise the bike according to their whim. 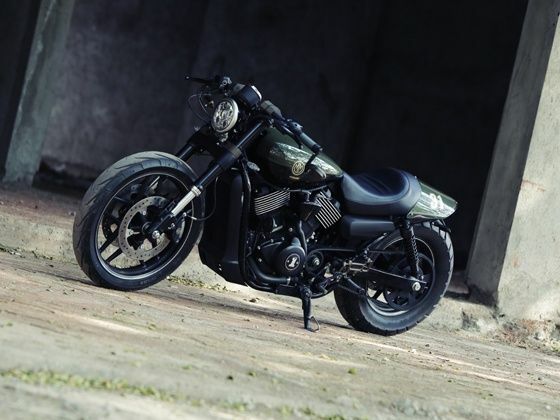 For this purpose, Mumbai based custom bike builder Moto Miu which is a subsidiary of the Seven Islands Harley-Davidson dealership in Mumbai have come up with the Katanga Uno custom cafe racer based on the Street 750. The name gets its inspiration from a subspecies of a lion ‘Katanga’ while Uno signifies Moto Miu’s first creation. For a custom motorcycle, visual appeal is of utmost importance and the Katanga Uno has oodles of it. With its beefy USD forks, low slung stance and large 19-inch front wheel, the custom motorcycle is certainly a head turner. Design highlights on the bike include its clip-on bars with bar-end mirrors, dual-tone paint job on the fuel tank, LED headlamp and the custom fabricated rear cowl. And we must say that the custom motorcycle did attract a lot of eyeballs and queries while we stopped for pictures. One of the interesting bits about the custom bike is that the masterminds at Moto Miu have not restricted their work on the cosmetic front. In fact, they have tried their best to reduce weight too. For this purpose, they resorted to a high grade T6 Aluminium billet which has been used to craft the foot-pegs, handle bars, fork brace and exhaust system. The use of aluminium has resulted in the Moto Miu Katanga Uno shedding over 20kg with respect to the stock bike. As I swung my leg over the saddle the first thought that struck me was that the riding posture was much sportier than the laid back posture of the stock Street 750. The rear-set footpegs and raised clip-on bars result in a forward leaning riding posture which took me some time getting used to. But the adjustable footpegs and four-way adjustable handlebars means one can change the riding posture depending on the rider’s choice. As I thumb started the V-Twin motor it came to life with a rapturous exhaust note which makes it sound more like its air-cooled siblings and does add more character to the bike. Open the throttle and the Katanga Uno gains momentum with a healthy pace and the added exhaust symphony in the background does make you feel that you are riding faster than what the speedometer indicates. The footpegs on the standard bike have a tendency to get easily scraped when leaned but gladly the designers have increased the ground clearance and raised the footpegs thanks to which I could lean the bike more aggressively round corners. Braking was the Achilles heel for the Street 750 and for this purpose the Katanga Uno features upgraded twin-disc brakes upfront that shed speeds efficiently. The Moto Miu Katanga Uno which we rode has been priced around Rs 10 lakh including the price of the donor bike. At this price point, the bike isn’t what would you call affordable but it isn’t your run-of-the-mill custom motorcycle which is all about poser value. The custom modifications make the Katanga Uno not just a pretty impressive bike to look at but a great motorcycle for your weekend rides too. Also, the Katanga Uno can be built with a WP sourced USD forks and a single disc brake setup at front for Rs 8 lakh including the cost of the donor bike.